Hohhot is the capital of Inner Mongolia and the political, economic, scientific and cultural center of the region and is recognized as one of China's better-known historical cities. The name Hohhot is Mongolian for "green city". It is known as a national forest city, a model tourist city, one of the global Top 20 for economic growth, China's Top 100 for economic strength, and China's Top 50 for investment and finance. It also has an abundance of dairy products. The cities of Baotou and Erdos lie to the west and Ulanqab to the east as well as Shanxi province to the south. It is a key point for China's western development strategy while, at the same time, providing a hub for the north, northwest, and the rest of the mainland. It also connects China with Mongolia, Russia and even Eastern Europe. The city has a continental monsoon climate and distinct four seasons with long, cold winters, short, hot summers, and violent weather changes in spring and autumn. Its coldest temperature can be -12.7℃, and the hottest, 22.9℃. The city covers an area of 17,200 square kilometers, with a 2,065-sq-km urban area. 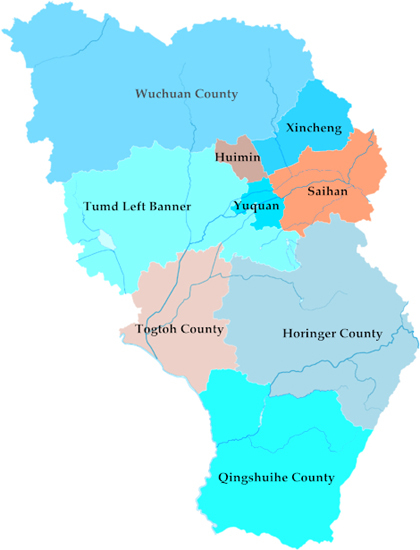 The administrative area includes four districts -- Xincheng, Huimin, Yuquan and Saihan -- and four adjoining counties -- Togtoh, Horinger, Qingshuihe, and Wuchuan -- and a banner called Tumd Left Banner, a national economic and technological development zone and a national high-tech development zone. It is home to nearly 3 million people.